Rob Heinsoo Games is running a Kickstarter campaign to bring 13th Age to the world of Glorntha. They're already well over their funding goal, so it's on to stretch goals for 25 days. 13th Age in Glorantha is a hardbound full-color 196+ page roleplaying supplement that brings the award-winning 13th Age rules to Greg Stafford’s mythic world of Glorantha. 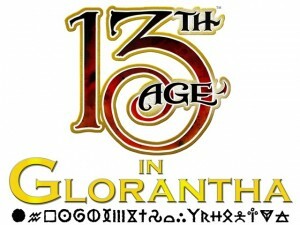 13th Age in Glorantha teams up the original designers of 13th Age, Rob Heinsoo and Jonathan Tweet, with their 13th Age comrade Ash Law and with the designer at the heart of the new Gloranthan renaissance, Jeff Richard. . . not to mention the marvelous Gloranthan artists who follow Jeff’s art direction. The book's classes, monsters, and rules are compatible with existing 13th Age games while opening new doors to myth-crawling adventure in the legendary setting of Glorantha. As a standalone supplement, 13th Age in Glorantha doesn't repeat the rules presented in the 13th Age core rulebook; you will need the 13th Age core rulebook to play.